The Schwinn MY16 430 and Schwinn MY17 470 Elliptical Trainers are both high-quality machines, ergonomically designed for comfort with lots of high-end features and options to keep your workouts varied and progressively challenging. 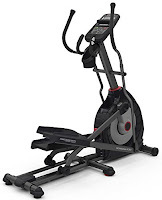 Both the Schwinn MY16 430 and Schwinn MY17 470 Elliptical Trainer Machines utilize a high-speed high-inertia perimeter-weighted flywheel together with Eddy Current Brake magnetic resistance for smooth and quiet operation. 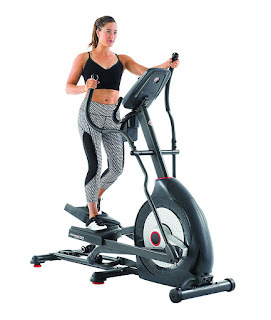 Both Schwinn elliptical trainers offer a 20” precision path stride length, large articulating footplates with cushioning for comfort, and dual-action ergonomic handlebars (static and moving). 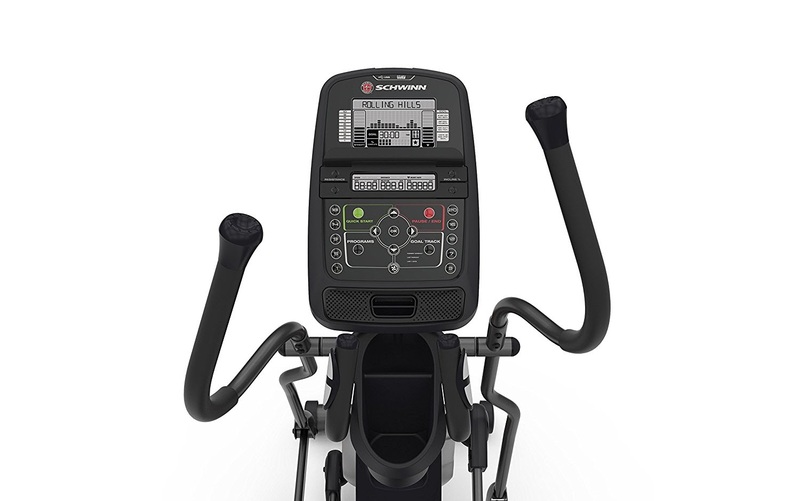 The Schwinn MY17 470 is the higher-end elliptical machine over the Schwinn MY16 430 and comes with an upgraded console that now includes Bluetooth connectivity and offers more ECB resistance levels (25 compared to 20) and more programs (29 compared to 22). 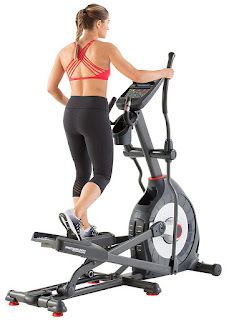 For additional challenge, both the Schwinn MY16 430 and Schwinn MY17 470 Elliptical Trainers offer adjustable incline which adds a new dimension to your workouts and works more muscle groups. 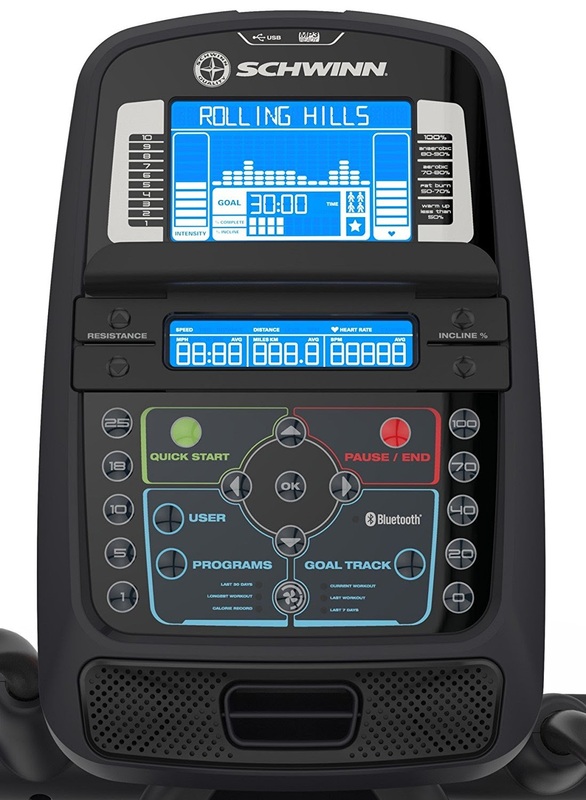 However, the adjustable incline differs between the 2 Schwinnn elliptical machines with the 470 offering a 10 degree motorized ramp with quick keys for ease of use, while the 430 offers a 10 degree manual adjustable ramp with 6 positions. Both the Schwinn MY16 430 and Schwinn MY17 470 consoles display motivating workout stats and offer performance tracking with Goal Tracker. For households where there are several people who want to use the elliptical trainer on a regular basis, the Schwinn MY17 470 has the advantage of allowing up to 4 different user profiles compared to the Schwinn MY16 430’s 2 user profiles. The Schwinn MY16 430 and Schwinn MY17 470 elliptical trainers both offer contact pulse-grip heart-rate sensors in the handlebars for monitoring your heart-rate to help you stay within your target heart rate zone. However, the Schwinn 470 has the advantage of also being telemetry enabled to use with a wireless chest heart rate strap (available separately). Additional premium features on both the Schwinn MY16 430 and Schwinn MY17 470 elliptical trainers include an acoustic chamber sound system with MP3 input, a media shelf, a 3-speed cooling fan, a water bottle holder. The Schwinn MY16 430 and Schwinn MY17 470 are solidly built with 2 integrated levelers for added stability, and allow for a maximum user weight capacity of up to 300 lbs. Both elliptical trainers come with transport wheels for easy relocation. Elliptical trainer machines offer a very effective low-impact total-body workout that’s easier on your joints compared to many other forms of exercise. The Schwinn MY16 430 and Schwinn MY17 470 are ergonomically designed for added comfort. If you’re looking for light-to-moderate exercise in the comfort of your own home, then the Schwinn MY16 430 would be more than adequate for your needs. It still has plenty of options to keep your workouts varied and includes many premium features typically found on more expensive elliptical machines. However, if you’re looking for more intensive exercise or you have more than 2 people in your household who want to use the elliptical machine on a regular basis (up to 4) then opt for the Schwinn MY17 470. You get the benefit of even more programs and resistance levels for additional challenges plus the convenience of Bluetooth connectivity. The Schwinn 470 is also worth spending the extra cash on if you’re likely to use the incline feature a lot, as it has the benefit of being motorized for ease of use.